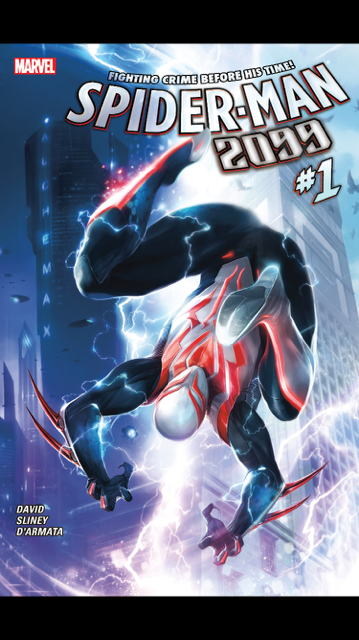 Spider-man 2099: Worth the Reboot? If you were expecting web slinging and action packed crime fighting for the first issue of Spider-Man 2099, keep holding on. Writer Peter David leaves you hanging, pun intended, with a slow start in what looks to be a great story ahead. David gives us a small glimpse of Miguel O’Hara, a genetics expert turned into a spidey experiment. A strong and arrogant character on the outside, O’Hara struggles with the truth of his reality: the strenuous task of figuring out what happened to the future through the past. He goes back into the earliest days (our present day) of the corporation Alchemax to figure out what happened to the distorted future in which he came from. In an attempt to not damage the timeline further, he must find out how to fix the future and find a way back. His first task which seemed to be a success did nothing to his doomed future when he uses a temporal portal in hopes of seeing restoration. O’Hara deals with a shocking and horrid situation with love interest Tempest. Does this post Secret Wars world story have what it takes to captivate readers? Does this post “Secret Wars” world story have what it takes to captivate readers? Will Sliney beautifully illustrates with a crisp artistic take on a reboot of the 90s classic. With amazing stand stills and scenery, David’s well written story flows from page to vibrant page. Though the story doesn’t start with a bang, this first issue presents what looks like to be a promising series.